Watch a live video workshop about Nature’s Scorecard! Learn what you can do to make sure your community is taking action to reduce pollution and use green practices. We envision a Puget Sound region that prevents pollution and manages stormwater in ways that protect our communities and waterways – do you? Now is the time to make sure our cities and counties comply with clean water laws and develop land in a smart way – this will ensure our waterways are safe for swimming and fishing and healthy enough to support wildlife and people. You have a role to play in shaping the future of your community – take action today! Development codes are written by local government staff, and must go to city and county councils for approval – and these council members are elected to represent people like you. Take a look at how your municipality is doing with low-impact development and let your council members know what kind of future you want to see. Review the scorecard to see how your local community is performing. Decide whether you want to contact your elected officials with a call, email, or by testifying in person. Craft and send your message! Your city and county councils make important decisions, and they welcome comments from residents like you. Find out who represents you and let them know how they scored! Find the email, phone, or meeting times of your city and county council here. We’ve put together a few tips about how to craft your message – be sure to check out the live video workshop above for more pointers! Talk about the future you want for your community and describe how these changes will impact you directly. Personal narrative is critical. Ask how council members plan to help achieve these goals. Clearly indicate your support for low-impact development. 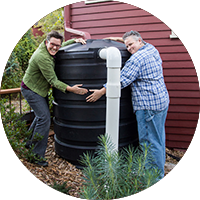 Talk to your neighbors about LID in your area. Together we can build healthy communities that will sustain and nourish our region, and future generations, while helping us solve the problems of the present. Become a member of Washington Environmental Council and Puget Soundkeeper Alliance. We’ll help keep you informed and active on the environmental issues impacting your community. Let us know if you’ve reached out to your community by tweeting with #naturesscorecard. Lacey received 5 out of 5 and a green star! Way to go City of Lacey!